WICKSoft has just announced the latest release of their mobile document access (MDA) suite for the BlackBerry, WICKSoft Mobile Documents. CrackBerry.com loyalists will remember we named WICKSoft and their MDA app as the Winner of the CrackBerry.com BEST of WES 2007 "NO BRAINER" Award. WICKSoft Mobile Documents (formerly called PocketVPN) allows users to securely view, email, fax, download and manage documents located in their office directly from their BlackBerry anywhere in the world (well, anywhere in the world as long as your Berry still works!). You could literally be tanning on a beach in Hawaii and be managing files located in your Windows home folder back in Winnipeg (it also works in Novell environments and with specific document management systems, including SharePoint 2007). Who needs a laptop?! WICKSoft has also updated their website, which now features some great flash demos that demonstrate the WICKSoft Mobile Documents solution in different application settings, including, Government, Financial, Legal, Medical, Real Estate and more. Visit their Solutions Page for the whole run through. If you want to get your hands on a copy to test in your organization, WICKSoft offers a free 30 day trial. OTTAWA (Canada) – 7 September 2007 - WICKSoft Corporation announced today the release of the latest version of WICKSoft Mobile Documents (formerly called PocketVPN), their award winning mobile document access (MDA) suite for the BlackBerry. Since winning the CrackBerry.com No-Brainer Award after this year’s Wireless Enterprise Symposium in Orlando Florida, the company has developed critical new features for WICKSoft Mobile Documents in order to extend its leadership in this new and growing space. This latest version allows users to securely view, email, fax, download and manage documents located in their office directly from their BlackBerry – an essential offering to mobile professionals who need access to their documents and files from anywhere. “A lot of people still see the BlackBerry as a phone and email device, but it’s been WICKSoft’s goal to make it more of a laptop alternative by providing full mobile document access” said Will Hickie, CEO and President of WICKSoft. No other company offers this complete and secure service to BlackBerry users. “WICKSoft has provided our legal staff with an entirely new way of using our BlackBerrys. Our users now have direct mobile access to their documents as if they were sitting in the office” says Tim Luimes at Labarge/Weinstein, a Business Law firm in Ottawa Canada. “I was able to install and deploy WICKSoft Mobile Documents in less than an hour.” Using WICKSoft Mobile Documents for the BlackBerry you can access a document stored in your Windows home folder, a Novell drive, or on SharePoint then view, email, fax, and manage files. You can also download files and transfer them to your laptop for full-fidelity viewing and editing. WICKSoft’s Mobile Documents utilizes two factor encryption, multi-layered policy-based security models, application-level access control, directory integration, and full Enterprise security management. ‘We give administrators an unparalleled level of control over their mobile environments—nobody else provides the same level of security.’ The current release supports Windows and Novell environments, as well as various document management systems, including SharePoint 2007. WICKSoft is a member of RIM’s BlackBerry Alliance. 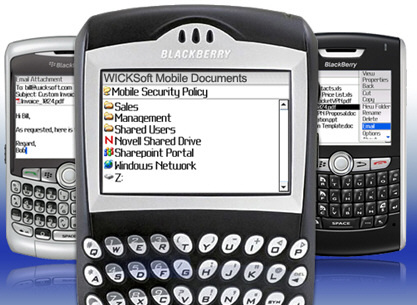 WICKSoft Corporation is the leading provider of mobile document access (MDA) solutions for BlackBerry enterprise customers.